Conventional liquefied natural gas tankers 1,100-feet long, 140-feet tall and 140-feet wide are proposed for operations in the Columbia Navigation Channel which is 600-feet wide and 43-feet deep. Think "large vessel event" in Columbia Navigation Channel and the New Carissa. 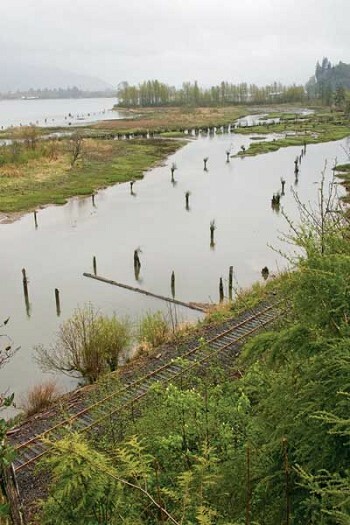 Any event which closes the lower Columbia River Navigation Channel for even a short period is a regional disaster costing tens of billions of dollars and impacting millions of Pacific Northwest families and businesses. Columbia River ports' data shows the Pacific Northwest's river traffic dependencies including fertilizers in and products out for regional agriculture; heating and transportation fuel in; Pacific Rim trades goods in and out; logs exports; cars importation; and other bulk commodities in both directions. The 465 mile Columbia and Snake rivers navigation system is the nation's largest (40 percent of total) exporter of U.S. wheat at 12 million tons per year. Economists apply a "multiplier" ranging from three to 10 to estimate the total value of raw materials purchased or harvested, value added jobs and other services associated with the value of finished goods shipped. The Columbia and Snake river systems total annual value of freight shipped is $16 billion ("The Columbia Snake River System," Jim Shaw, Pacific Maritime Magazine, June 2006). An event which closes the lower Columbia River Navigation Channel closes the whole system. The costs of such a closure can be estimated at $48 to $160 billion a year. Liquefied natural gas on the Columbia represents large risks to many and large profits to a few private and foreign investors. Currently, the lower Columbia Navigation Channel services 4,000 annual transits for 2,000 total "calls" to all ports. Total conventional traffic and cargo calls are projected to increase to 3,000 per year. Six thousand projected Lower Columbia passages per year or 15 to 20 lower Columbia transits per day will "in channel transit" (pass) 500 proposed LNG tanker transits per year. All 6,000 conventional vessels in transit will be required to stop or hold in designated "meeting zones" when LNG tankers are in the channel. What is the actual value of the LNG imports to the region versus the risks and delays to conventional traffic? Who has done "due diligence" on these regards? Who has done even a preliminary risks-benefits cost analysis? LNG is just more imported fossil fuel, but LNG is much more volatile and explosive and is delivered in more vulnerable vessels. LNG tankers are recognized as attractive and obvious targets. New generation "Q-Max" LNG tankers carrying 60 million gallons of LNG, also proposed for Columbia River operations, are twice as large as existing LNG tankers. LNG represents a huge gamble versus the "benefits" now being loudly proclaimed by the deceptive "LNG is Green" public relations campaign being paid for by Northwest Natural and foreign investors.